Mission: One Team, One Goal: Student Success! Welcome to the Carl J. Harrison High School, home of the Hoyas! We're a Georgia School of Excellence, serving high school students in Kennesaw, Georgia. 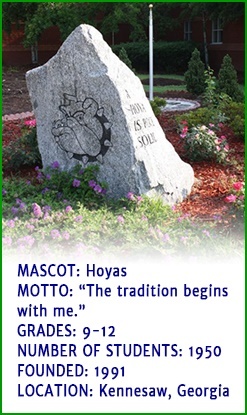 We strive to live up to our reputation for excellence in our rigorous academic curriculum, our many extracurricular activities, and our outstanding athletics teams. We invite you to browse the pages of this site and learn about our exceptional programs, our dedicated administration and faculty, and the many other things our high school has to offer. Please view our school strategic plan to learn more. Check out our school's mission and vision. We know you’ll be impressed. Our Harrison Summer Academy is from June 3 through June 27, 2019. Final exams will be on Tuesday, May 21 and Wednesday, May 22, 2019. We are starting our first ever STEM summer camp for rising 6th, 7th, and 8th graders! It is time to enroll in the Combination Chemistry course! 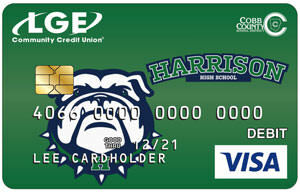 LGE Community Credit Union has created high school spirit cards where each high school in our district will have their own VISA card. The state of Georgia is offering a civic engagement diploma seal to graduating seniors who meet certain requirements in coursework, knowledge of American government, community service, and civic engagement activities. The 2018–2019 governor's honors program time line is now available. The counseling department would like you to be aware of some important dates throughout this school year. Have you registered for the ACT or SAT? For additional announcements, please visit our News page.